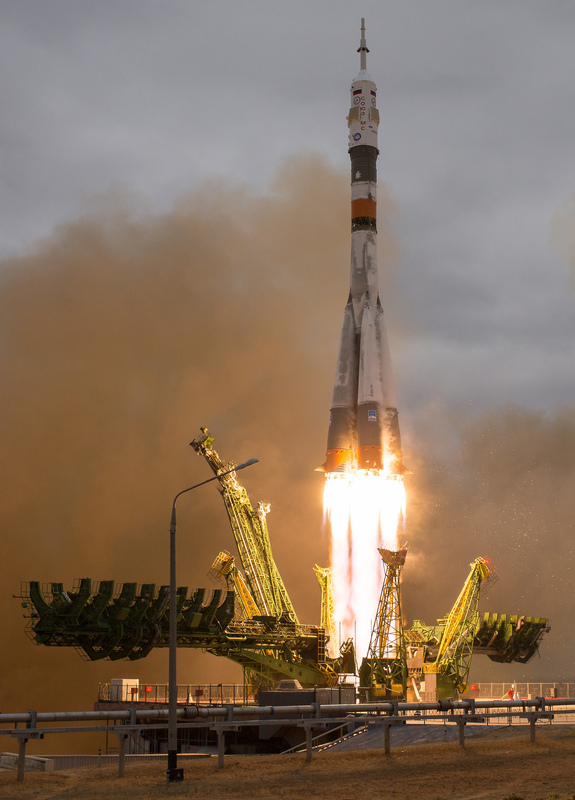 The mission used the conventional two-day approach, launching atop a Soyuz FG rocket on Wednesday and adjusting its orbit later that day to set up for a fully automated approach on Friday morning leading up to contact and capture at 9:52 UTC. Soyuz Commander Sergei Ryzhikov and Flight Engineers Andrei Borisenko and Shane Kimbrough are joining the crew of ISS Expedition 49 that will only be in effect nine more days as current station commander Anatoli Ivanishin and flight engineers Takuya Onishi and Kate Rubins gear up for an early morning return to Earth on October 30. The handover timeline was compressed by the four-week launch delay suffered by the MS-02 spacecraft due to a damaged cable in its Entry Module that needed replacement followed by re-testing to ensure the shorted cable did not affect any other systems on the craft. In addition to handing systems and experiments off to the new ISS residents, the crew will be busy on Sunday when the Cygnus OA-5 cargo ship will make its arrival, aiming for a capture by the robotic arm to be berthed to the Unity module for a month-long stay. Ryzhikov, Borisenko and Kimbrough will have ISS to themselves for over two weeks after the departure of the Expedition 49 crew. 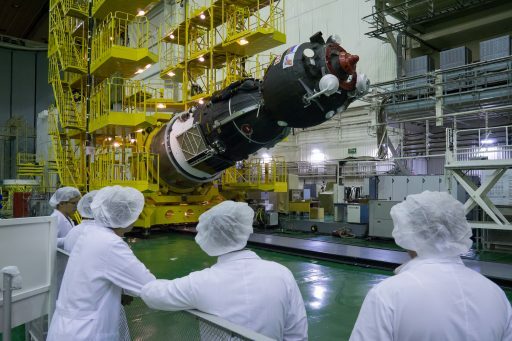 The next Soyuz is currently entering its final processing campaign at the Baikonur Cosmodrome to be readied for a November 15 liftoff with a trio from Roscosmos, ESA and NASA. The Soyuz MS-02 crew began their journey to ISS on Wednesday, strapping themselves into their seats on top of 274 metric tons of explosive propellants to ride into orbit atop Russia’s Soyuz FG rocket. Acing its 57th trip into orbit, Soyuz FG lifted off at 8:05 UTC and provided the crew with a safe and very precise ride into a 200-Kilometer orbit from where they began chasing down the Space Station. Immediately after being set free after an eight-minute and 48-second ascent into orbit, Soyuz deployed its two power-generating solar arrays and communication antennas, also pressurizing its propulsion system to begin stabilizing its orientation in space – all under the watchful eye of the three crew members. Flying the second Soyuz MS mission, the crew had a number of testing activities on their flight plan while also setting up for orbit-raising maneuvers that were conducted on the mission’s third lap around the planet to lift the Soyuz into an orbit around 100 Kilometers below that of ISS, still chasing the complex down from below and behind. Being the second flight of the upgraded Soyuz MS series, a number of testing activities were lined up for the crew’s first day in orbit. Though many of the new systems were sequentially introduced on the recent Soyuz TMA-M flights and were also flown on three Progress missions as well as Soyuz MS-01, it was decided to complete more testing in the actual flight environment. Testing performed by Soyuz MS-02 had a particular focus on the backup and fail-safe systems of the spacecraft, checking whether crews could assume manual control of the Soyuz. The crew was planned to complete a manual attitude control exercise before commanding the SKD main propulsion system to see whether Soyuz could still be maneuvered in the event its automated control system becomes unavailable for some reason. Over the years, the Soyuz spacecraft fleet has been upgraded several times to keep up with the current state of technology and make the spacecraft more flexible while also increasing robustness in the various onboard systems. The MS upgrade introduces a number of modified systems, first and foremost a Unified Command and Control System that replaces the old Kvant-V radio and allows Soyuz to communicate with Mission Control through the Luch Data Relay Satellites that cover around 70% of the spacecraft’s orbits around the Earth, vastly expanding communications compared to the past when Soyuz only had short ground station passes on half its daily orbits. The Soyuz MS also hosts an improved power system with a more efficient solar cells and larger solar array area and an additional battery. Soyuz MS features a new thruster arrangement that only uses the more powerful 130-Newton DPO engines installed in pairs to achieve a fully redundant attitude control system. This architecture also improves the contingency deorbit burn scenario by raising the number of DPO thrusters available for delta-v burns from two to four. 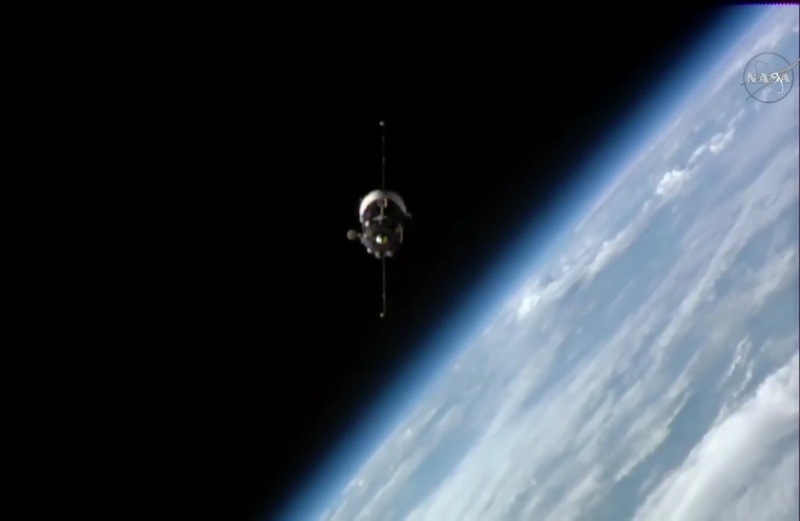 Soyuz MS had its Orbital Module reinforced with additional debris shielding, hosts an additional drive mechanism in its docking system, makes use of satellite navigation for orbit determination & basic attitude knowledge, and uses a new digital video processing system to deliver onboard video to the ground and ISS. Other changes include the addition of GPS/Glonass receivers and Kospas-Sarsat search and rescue beacon to the Entry Module to help recovery teams locate the craft after landing. Having spent two nights in the confined quarters of the Soyuz, the three crew members were ready to upgrade to the comforts ISS has to offer and pressed into their rendezvous in the early hours on Friday. 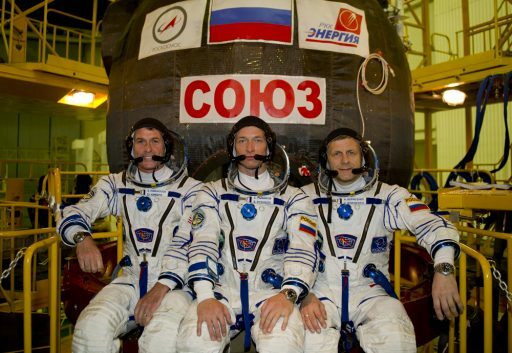 Seated in the Entry Module, the three crew members oversaw the initiation of the Automated Rendezvous Sequence at 7:34 UTC when Soyuz was still 100 Kilometers below the Space Station. A ground-targeted burn known as DV4 increased the spacecraft’s velocity by 30 meters per second and placed Soyuz on a course to enter the 200-Kilometer communications zone around the Station. 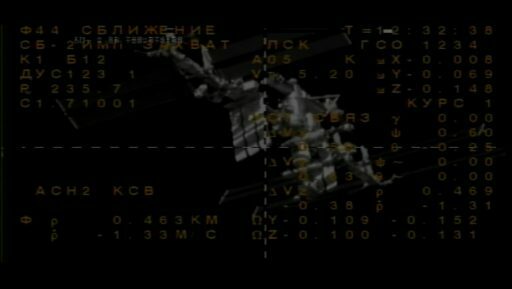 The Proximity Communications Link was established around 8:16 UTC when Soyuz was still over 200 Kilometers from ISS followed by the activation of the KURS radio navigation system to begin the relative navigation phase of the rendezvous. 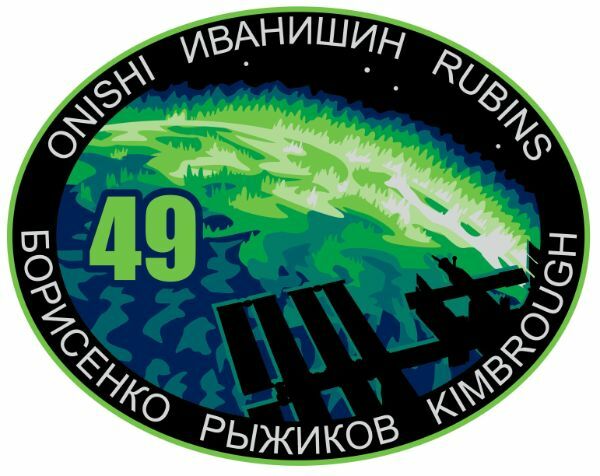 The new and improved KURS-NA system on the Soyuz first searched for the beacon signals coming from its KURS-P counterpart on ISS to lock onto the Station’s signal and re-orient Soyuz to face the new AO-753A phased array antenna toward ISS for pitch and line-of-sight angle measurements. AO-753A, installed on the Orbital Module, replaces the VKA omni-directional antennas used in the early rendezvous phase and the complex 2AO rotating antenna that was previously used for angle measurements during the far-field rendezvous. Later in the rendezvous, KURS used the two ASF-1 antennas retained from the old KURS-A system to deliver range and range rate in addition to the angular information. Soyuz fired up its 300-Kilogram force SKD engine at 8:44 UTC for an 80-second burn to change its speed by 33 meters per second and begin aiming for the International Space Station. Per the standard rendezvous design, Soyuz first targets a point one Kilometer from ISS in order to preserve the option of passively-aborting its rendezvous and flying past ISS in case of any problems. The KURS System was tested twice, at 80 and at 15 Kilometers, to ensure correct navigation data was provided by the system. Passing a range of five Kilometers, Soyuz began reducing the targeting offset by firing up its SKD engine for a pair of burns while the last braking impulse was handled by the DPO thruster system to slow the Soyuz down for the flyaround maneuver commencing at a distance of 400 meters. 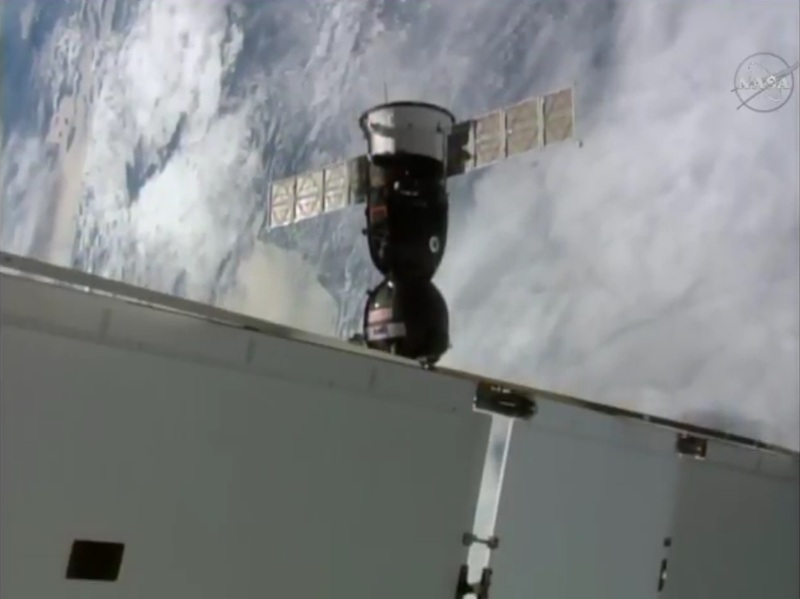 Soyuz remained on Auto-Pilot throughout its slow lap around the Space Station, slowly lining up with its Poisk docking port. Once aligned with Poisk, Soyuz conducted a roll maneuver to properly position its solar arrays for the docked mission before coming to a complete halt as part of a short Stationkeeping Period. With no issues and Soyuz in excellent alignment, Sergei Ryzhikov was cleared to send commands to initiate the final approach. Firing its DPO thrusters, Soyuz initiated a gentle closing rate of 0.8 meters per second that was further reduced to 0.2m/s as the straight-in approach progressed. 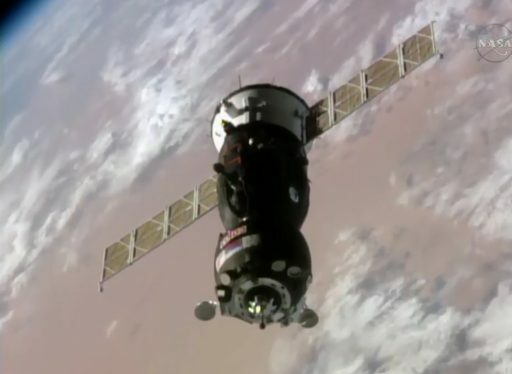 Soyuz kept is cross hairs in perfect alignment with the docking target and powered up its docking mechanism while the crew closely watched over the approach to their home in space for the next four and a half months. 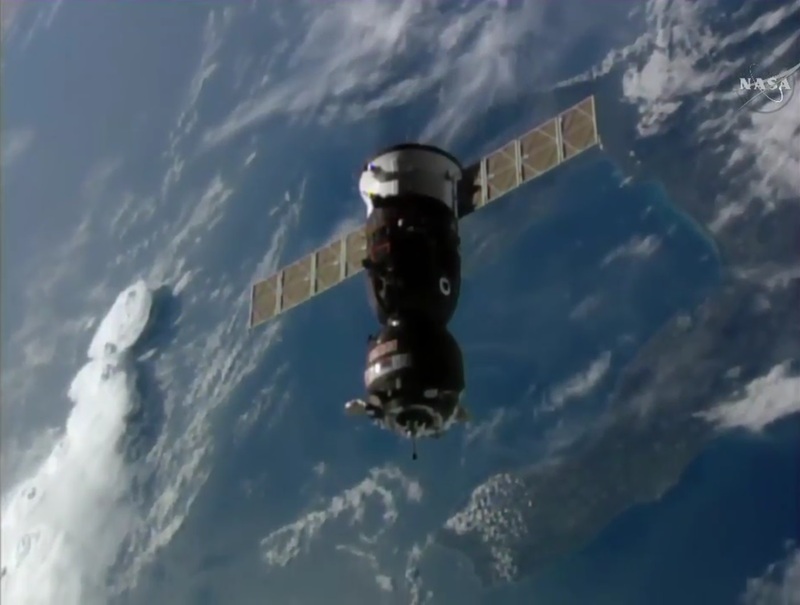 Upon contact, confirmed at 9:52 UTC, Soyuz fired its DPO thrusters to push forward and ensure capture latches within the docking mechanism engage in order to obtain a safe capture. ISS went into Free Drift the moment docking occurred to prevent any thruster firings on the Station side. 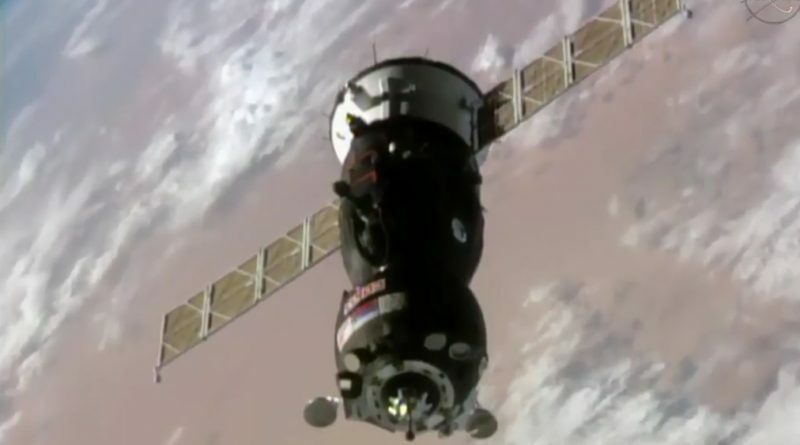 Docking occurred 400 Kilometers over southern Russia, around seven minutes ahead of schedule after a shortened Stationkeeping period as has become common for Soyuz arrivals. 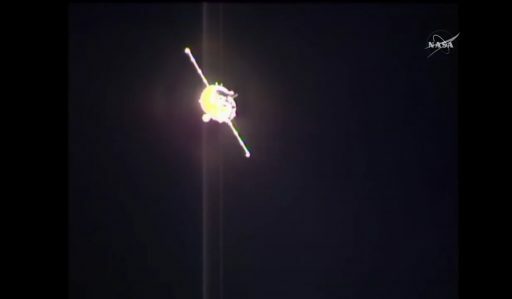 Relative motion between the Soyuz and ISS was allowed to dampen out for a few minutes before the docking probe retracted and hooks on both sides of the docking interface were closed to establish a rigid coupling between the Soyuz and Space Station. With the redundant pressure seals tightly pulled together, the interface between ISS and Soyuz was pressurized for the standard hour-long leak check. In the meantime, Soyuz was transitioned to ISS power supply and hard line communications and the crew used the leak check period to change from their Sokol Launch and Entry Suits they put on for the docking back into more comfortable flight suits. When leak checks were complete, ISS Commander Anatoli Ivanishin opened up the hatch on the Poisk module to permit Soyuz and ISS to equalize pressures before the Soyuz hatch could be opened as well. 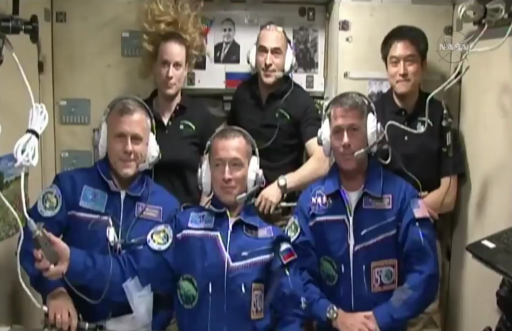 Hatch opening was marked at 12:20 UTC. Floating into the Station, two of the three Soyuz crew members returned to a familiar environment while Commander Ryzhikov makes his first visit to the complex. Andrei Borisenko returns to the Space Station after staying in orbit 164 days as part of ISS Expedition 27/28 in 2011 while Shane Kimbrough has not yet seen ISS in its fully assembled state as his first visit was in 2008 aboard Space Shuttle Endeavor for an ISS assembly mission. Greeted by the resident Station crew whose mission is slowly winding down, the new crew members quickly made their way to the Zvezda Service Module for the traditional family conference, talking to their families and friends who have gathered at Mission Control Moscow after flying back from Baikonur. 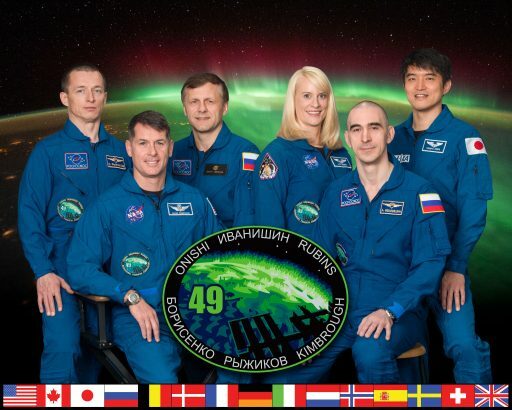 For their first day aboard ISS, the combined crew is set for a series of safety briefings during which Commander Ivanishin and USOS lead Kate Rubins will walk the new crew through emergency procedures and the location of fire extinguishers and personal protective gear. The Soyuz crew will later deactivate their Spacecraft, set their Sokol suits up for drying and prepare their crew quarters aboard ISS for their first night in the comforts of the Space Station, having been in a tight squeeze aboard their Soyuz for two days. It will be a busy last week of Expedition 49 as the departing crew prepares for their return, Cygnus arrives aboard the station, and the new crew members get familiarized with the intricacies of the different procedures and experiments they will have to tend to once the Station is in their hands. The crew of Soyuz MS-02 is currently booked for a stay of 128 days, looking at a return to Earth in late February 2017.